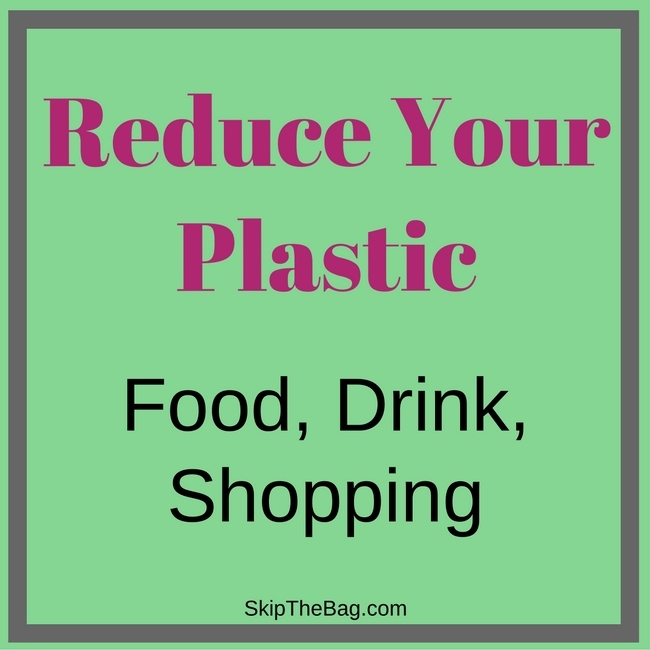 My friend Rosie at Green and Rosie Life posted 100 ways to reduce plastic and how she was doing with it. I thought I would do the same. I'm going to break it down so this week we are going to cover food, drink and shopping. There are a total of 24 tips in this section. Leave a comment about how many you are doing! Most links are to other posts I have written. Some links are affiliate links to Amazon. If you click the link and make a purchase I may receive a commission that helps to keep the blog running. Thanks for supporting Skip The Bag! This was one of my Green Resolutions. I was doing great during the 1st quarter update, but I haven't done a midpoint because I am failing at this one part. We have one store that has bulk food locally and it's unfortunately not the one that I go to often. I still want to go, but I think I'm in the contemplation stage and need to just do it! I do this! Especially if it is a food I buy in bulk. I take the jars with me. You can read my bulk buying tips, which make it very easy. I rarely drink soda. I have started a small habit of drinking carbonated flavored water out of cans, which I'm trying to break. In fact I want Hubby to rig up our own carbonated water dispenser. I do try to avoid plastic bottles as much as possible especially for water! I have my own water bottle that I usually carry around. We could do better at this. Ideally we would grow our own lettuce and cabbage, but unfortunately we haven't had much luck. We have tried to make our own sauerkraut, and love making coleslaw from cabbage and poppyseed dressing, but generally at least one of the steps uses plastic. This last time I went to the store I wanted to get plastic free lettuce, but they did not have any if you can believe that! But our tomatoes are going gangbusters and our peppers are holding their own. So we have some of the components, bust not all of them. I try! But honestly it is a challenge. I'm not sure why it became a norm to group a couple veggies together and place on Styrofoam and wrap with plastic wrap. Have we become so lazy that even picking out 3 or 4 squash is too much for us? Absolutely! And you can use your own produce bags and use as many bags as you want! We do pretty well preparing our own food, but there still are some conveniences. It seems like they always come in Styrofoam. We don't get much food to-go, we generally would dine st the restaurant. So for us leftovers is the spot where we could cut down on Styrofoam and plastic containers. We buy in glass and have made our own in the past. I think technically it was aioli, but either way it was yummy. We may have to try it more regularly. I chew gun about once a year or so. I can't remember the last pack I purchased. So this is such a rare imevent. However I didn't know it was made with plastic! We love having our garden. We aren't really replacing a significant portion of our food supply yet, but we haven't had to buy tomatoes, bell peppers, or basil for a while! I love our local farmers market. I've heard there is another one in the next city over, but I haven't made it over there yet. But they are great and you can use your own produce bags and reusable bags. I am on the hunt for places that has all of this. I went to a local butcher shop, but it had all of its meat in Styrofoam and wrapped in plastic. So that was a bust. I was able to find unwrapped bread at four winds so that was exciting, but I don't regularly shop there. Enjoying this list? Don't forget to pin it for later! I'm not a huge milk drinker. I haven't found, or sought out a milk man. However I guess they do sell milk at the weekly farmer's market. So I suppose that could be considered a modern day milk man equivalent. I did find out that our local grocery store that sold milk in a glass container with a deposit. I am ashamed to say that I used to always get ice cream in a cup because it was fewer calories. All those plastic spoons are haunting me. Now that I carry around my own silverware kit, I suppose I would eliminate the plastic spoon and only have to worry about the bowl. I have wanted to try this, but haven't. I also rarely eat yogurt so that is probably one reason why. I don't eat a ton of snacks like this, so that's how I reduce the amount of waste created from these items. However I see that in the future that might change, so I should start making more of these. I try! Unfortunately shopping at places like Sam's Club makes this difficult. 20. 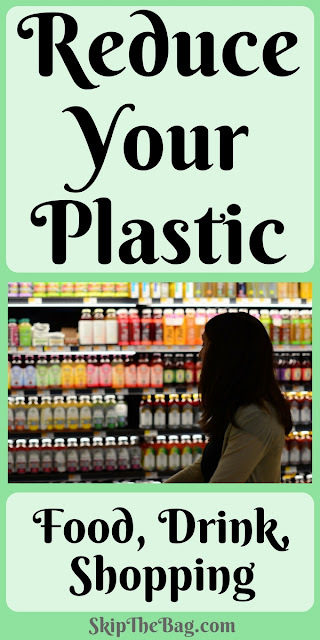 If you must buy something in plastic buy the biggest size possible which contains proportionally less plastic per kg/litre of product. I generally try to do this when it makes sense and the item will not spoil before it can all be eaten. Now this is a suggestion I can get behind! Let's all buy wine. If it has glass and cork, it's zero waste and natural. Besides there are tons of crafts you can do with the girls too. I'm not entirely sure what this is referencing. Especially in terms of food. I can see show getting larger bottles to refill the small bottles of items like soap would save on plastic. But condiments are about the only food product I could see refilling and I'm not sure that would save on plastic waste. Thankfully I don't like coffee so this isn't a huge draw. Although I know they have items like hot chocolate and tea too. I'm also not a huge tea drinker, but my preference, of course, would be to avoid plastic in my tea bags. Loose tea is definitely the way to go. My sister in law got me an awesome mug for making loose tea that I love. Phew! What a great list. I'm happy to say that I'm doing more of these than I'm not doing. Ready to start tackling the bathroom? 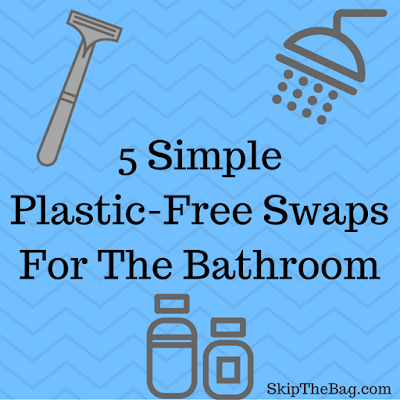 Here are my 5 simple plastic free swaps for the bathroom. #7 is something I do all the time and I feel like cashiers give me side eye for it! But really those cheap plastic produce bags are just to carry the food home from the store and nothing else. I always skip this bag! With plastic becoming such a hazard to the environment, this article is worth a read. I wish everyone is as sensible and caring about the world as you are. Thanks for the tips, will try to implement them into my life too. This is brilliant, Katy and THANK YOU for taking up the challenge. 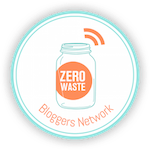 I have been pretty much off blogging for the summer so I have only just caught up with this. I will have a proper read of all the posts later. With regard to #22, it was in the wrong section and should have been in either personal or home care. I was referring to things like shampoo or cleaning products. I'll edit my post and put it in the right place!